Join us for our 41th year of George Downing's original musical melodramas. 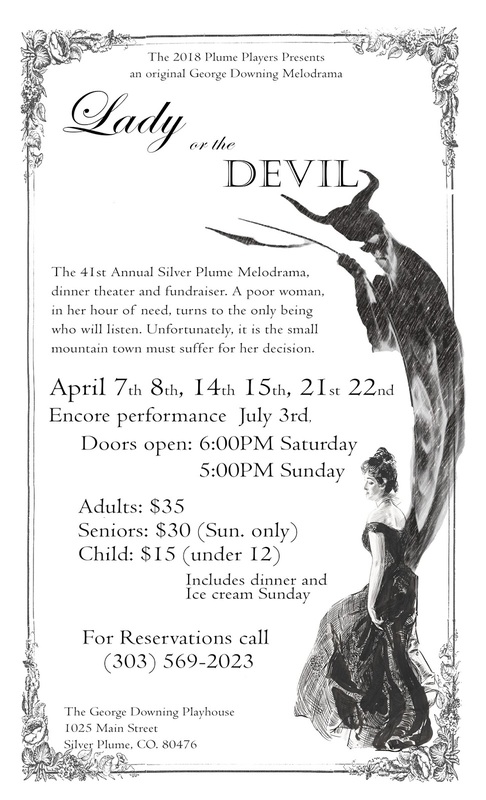 "The Lady or the Devil" with songs and musical co-ordination by John McEuen and John Wilson. Dates this year are Saturday and Sunday evenings of April 7&8, 14&15 and 21&22. Doors open 6pm on Saturdays and 5pm on Sundays. There will be a reprise on the evening of July 3rd, door opening at 6pm. Price includes performance and buffet dinner with dessert $35 Adults. $30 Seniors on Sunday only. Kids $15. Click on poster to enlarge and print for your friends and neighbors - both.